Ei Arakawa’s Tryst presented Gutai as musical theatre at Taka Ishii Gallery Tokyo. Radical artists and musical theatre usually occupy different worlds. But suppose they didn’t. What if the story of the Japanese post-war artist group Gutai was told as a musical? The struggles it faced, the validation it sought, the critics it wooed – even the untimely demise of the founder. 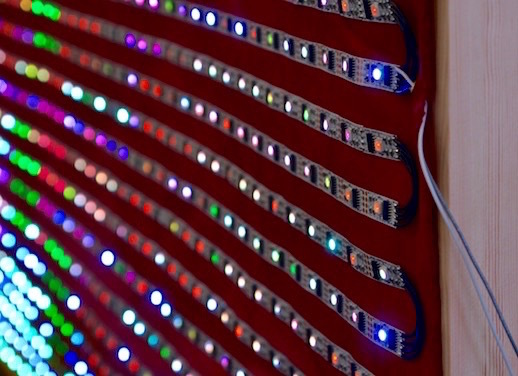 Rather than live performers, what if flashing LED displays of the group’s paintings sang the songs? “Tryst” (Feb. 10–Mar. 11, 2017), Ei Arakawa’s first exhibition at the Taka Ishii Gallery in five years, did just that. A tryst is a private rendezvous between lovers. The one alluded to by the title is the connection between Gutai founder Jiro Yoshihara and the French critic Michel Tapié, whose alliance paved the way for what would eventually become a global contemporary art market. Uniting painting with performance, the show consisted of five shimmering LED screens that enticed visitors to walk across the mat – only to advise them not to do so. One of these handmade “paintings” on upright fixtures rested on the edge of a large green mat displaying an Art Basel logo. The original works the installations referenced were all from 1959, a turning point in the history of this movement preoccupied with the material over the abstract. It was in this year that the Gutai artists began exporting their work overseas. Arakawa’s artistic approach welcomes collaboration. For “Tryst,” he teamed up with David Zuckerman as composer and Dan Poston as co-writer of the lyrics. Musically, the production is full of cheery melodies and catchy refrains. Just short of 40 minutes, there are nine songs in all, spliced between excerpts of dialogue. One Perfect Painting is a dreamy, longed-for ballad that ends with “…coming soon”. ¥en ¥e ¥e, ¥en ¥e ¥e, ¥en ¥en! contrasts the artists’ financial struggles with the pull of the market. A shady-sounding riff lures the listener in and the song builds until the artists chant the names of currencies in punchy staccato. At the centre of “Tryst” is Jiro Yoshihara. Arakawa’s politically attuned biography introduces him as “a painter, a critic, and also an heir of a salad oil company”. 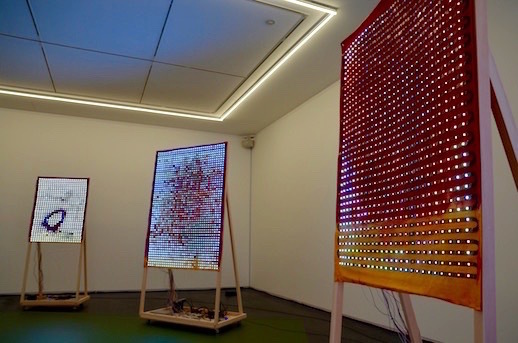 Since this musical concerns alliances, Jiro shares his LED painting with Michel Tapié. The other LEDs pair the artists Kazu/Suda, Akira/Sabu, Atsuko/Tsuruko and Shozo/Allan together. Jiro/Michel states: “I am Jiro Yoshihara, leader of Gutai. I am Jiro, but at the same time, I am not Jiro. Every character is more or less mixed with several other people’s personalities. So I am Jiro, but not Jiro”. Portrayed as a demanding critic and a dismissive mentor in pursuit of originality, Jiro/Michel is capable of self-criticism but seeks the validation of scholars. At his most vulnerable, he even asks for the assistance from his proteges. Tellingly, Jiro/Michel is also the only character to have a robotic voice, ensuring that he is easy to identify while remaining at a distance throughout, always difficult to identify with. Another outcome of his android voice is that, towards the end, after a rift forms between factions of artists, some are accused of “joining the robot chorus”. “Tryst” joins other works by Arakawa that contextualise Japanese post-war art within the broader history of contemporary art. In the past, Arakawa has appropriated from other avant-garde groups like Jikken Kobo and Fluxus, collectives that also embraced collaboration and multi-disciplinary approaches. It would be erroneous to think of these works simply as homages. “Tryst” carefully sites the meeting of Jiro and Michel as the advent of the global art market. Art about art always runs the risk of alienating some gallery-goers, but “Tryst” is entertaining enough to appeal to viewers unfamiliar with Gutai – it talks to you, not down to you. There are even mentions of familiar technology (Instagram and email) to put newcomers at ease. But the real attraction of “Tryst” is in the writing and in how absurd the story sounds when set to music. Following the protagonist’s sudden death, Gutai is left without a leader and its members disband, liberated from the weight of expectation. Jiro/Michel returns from the grave to evaluate the work of his followers one last time. As ever, he is committed to exhausting the possibilities of his present condition. “I can’t die enough!” he exclaims.